The last Boeing C-17 Globemaster III cargo plane built at the company's Long Beach plant departed from the facility Sunday, ending production — at least for now — of the last military or civilian aircraft to be built in California. 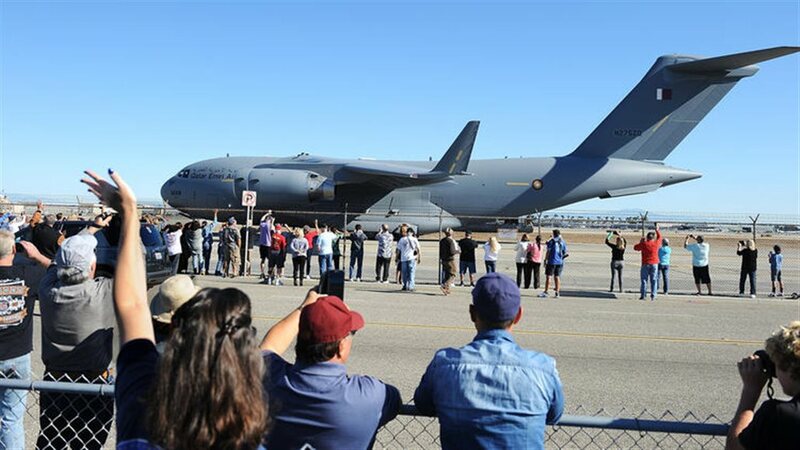 In an event attended by hundreds of Boeing employees, the aerospace giant officially ended production of the C-17 with a rollout of the final transport and a flyover near the company's assembly plant at Long Beach Airport. To cheers and shouts of "Here she comes!," the dark gray C-17 with Qatar Air Force insignia taxied onto the airfield about 12:15 p.m. and paused in front of the crowd that lined Globemaster Way bordering the airport. It took off 15 minutes later, circled back in a banking turn and passed low over the runway complex. As people clapped, the four-engine plane then climbed steeply and faded into the sky as it headed to San Antonio, where the Qatar government will pick it up early next year. "It's a pretty amazing day but a somber one," said Mark Adams of Stanton, who was employed by Boeing for 38 years before retiring in January. "I loved working for the C-17 program. I'm proud of it. It gave me opportunities to grow as an employee." The 25-acre factory that produced 279 C-17s also is being shut down, representing a setback for the local economy and the loss of almost 400 high-paying manufacturing jobs. "This is truly the end of an era. It's a sad day, but one that all of the Boeing employees and suppliers who have worked over the years on this great plane can be proud of," said Nan Bouchard, a Boeing vice president and C-17 program manager. Boeing officials say they will continue to provide support, maintenance and upgrades for the worldwide fleet of C-17s at its Long Beach facility. The plant was built in the late 1980s by Douglas Aircraft Co., which won the U.S. Air Force contract to produce the C-17 Globemaster III. Douglas later became McDonnell Douglas Corp. In 1996, Boeing bought its longtime rival and assumed production of the C-17, one of the most sophisticated cargo planes in the world. The Long Beach plant was once part of an enormous aircraft manufacturing complex that dated to World War II. Tens of thousands of people worked in the facility's hangars and assembly lines turning out MD-80 jetliners, Boeing 717s and B-17 bombers. Boeing has closed or sold off most of those production facilities over the years. In 2012, for example, the Sares-Regis Group of Irvine, a commercial real estate developer, bought much of the company's Long Beach holdings. During the C-17's production run, the Air Force bought 223 planes, the last one delivered in 2013. Dozens of other C-17s have been sold to foreign militaries. Bouchard said the plane is well known for its use in providing humanitarian aid around the world and has "changed the way the U.S. Air Force and our international partners mobilize for operations and aeromedical support." The wide-bodied transport can carry more than 80 tons of troops, supplies and vehicles, including the U.S. Army's M-1 Abrams tank. It can operate in remote regions that lack modern runways. But as orders dwindled, Boeing announced in September 2013 that it would close its last assembly plant in Long Beach. Boeing announced that it expects to lay off 739 workers in the state this year, all in Southern California: 397 in Long Beach, 189 in El Segundo and 153 in Huntington Beach. "It's a sad day," said Randy Sossaman, who worked 25 years for the C-17 program and is an official for UAW Local 148, which represents Boeing workers. "We thought we could work here as long as we wanted without being forced out." Boeing still has a military aircraft project in California, producing the center and rear fuselage sections and parts of the tail assembly for the F/A-18 Super Hornet. The parts are being made by Boeing subcontractor Northrop Grumman in El Segundo. Boeing officials say that the plane is assembled outside California. In the coming decades, the U.S. Air Force is planning to replace its fleet of strategic bombers, which could result in contracts to aerospace companies in Palmdale, potentially creating thousands of jobs. At one time, Boeing was Southern California's largest private employer, but it has reduced its workforce in the state every year since 2001. Boeing now estimates that is has more than 16,000 workers in California, less than half of the 35,000 who were employed 10 years earlier. The company has been moving operations to states with lower taxes and labor costs, such as South Carolina, Alabama and Oklahoma. The C-17 "has been a great program with great people. But times change," said James Dawson of Rancho Cucamonga, a veteran Boeing employee who attended the flyover with his 8-year-old grandson, C.J. Perez. "I was here when the first C-17 left, and I am here for the last C-17."